On Monday, a student in my Modern Composition Theory seminar requested an overview of what we'd done during the semester for the purposes of studying for the rhet-comp comprehensive exam. So I took an earlier handout I'd given them -- a list of the semester's readings in chronological order -- and grouped them roughly, which is what the student had asked me to do. 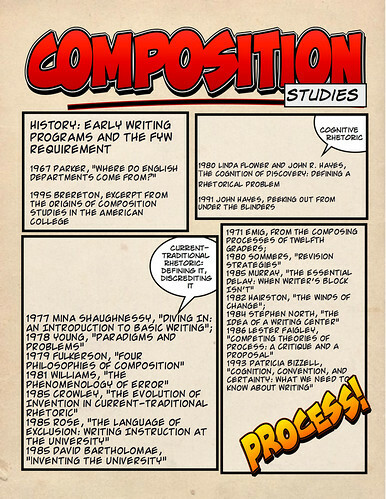 We used the Norton Book of Composition Studies in the class, and (as it's on the reading list for the PhD comp in rhetoric and composition) I intended it as a foundational text to sample the ideas in the field's history. The students are working on their own projects as well, which entail a lot of focused reading in their areas of interest. So yeah, these are my headings I'm putting these readings under, and I know there are possible objections. I could have put Bartholomae in some other panel instead of the one I labeled "Current-Traditional Rhetoric: Defining It, Discrediting It," and we talked about that a little in class this afternoon, as well as other cases, like the Matsuda piece, which I guess could go in the computers and writing panel. 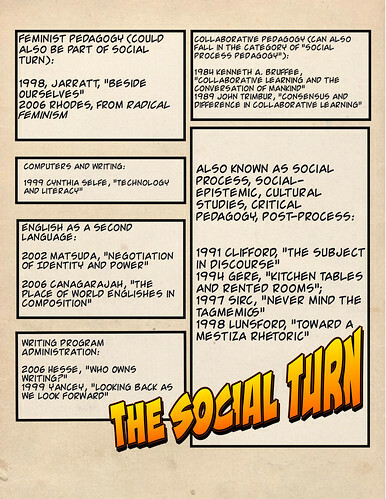 Also, yes, I realize that there are differences among social process, social-epistemic, cultural studies, critical pedagogy, and post-process, and we talked about all of these distinctions today. Still, I was a little nostalgic for ComicLife, having not used it in a few months, so I decided to get a little creative with the handout, if you count using one of the program's templates as "creative."